Remove prawn heads and cut away whiskers. Set aside for other uses such as making stock. Remove shells and devein prawns. Butterfly and rinse thoroughly, then marinate for about 15 minutes. Rinse pork and marinate for 30 minutes. Slice tofu in equal thickness accordingly to your liking and deep fry till golden brown. Drain and set aside. Heat oil in pan and sautéed garlic till fragrant. Add prawns and fry till they turn pink. Remove and add pork. Stir fry till fragrant. Remove and set aside. Lay your tofu neatly on pan, lower heat then pour the beaten eggs evenly. Throw in prawns and pork, and then drizzle the Lee Kum Kee XO Sauce over. Cover and let it cook for about 2 minutes. 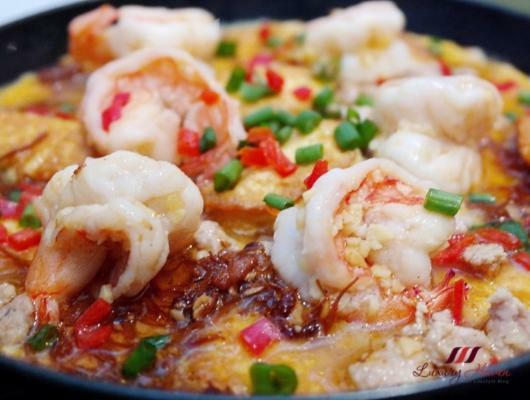 Sprinkle spring onions and chillies, top with more minced pork (optional), and serve your delicious home-made Hotplate Tofu with Prawns ( 铁板豆腐虾 )! Hotplate Tofu is one of the very popular Chinese cuisines in Asia and a hot favourite too. If you don't have a hotplate to make this yummy dish, just use any metal pan like this one that I have bought from Daiso for just $2! The result is just as delicious minus all that the sizzling. With the Grey Prawns ( 灰虾 ), Pork Minced Meat ( 碎肉 ), Egg Tofu ( 蛋豆腐 ), Red Chilli ( 红辣椒 ) and Spring Onion ( 葱 ), I made this Hotplate Tofu ( 铁板豆腐 ). For those who can't take pork, simply replace with chicken instead.